This machine is designed for small printing shops, whether it is for multi-color or volume printing, this equipment can also serve as an ideal backup solution to larger companies. For those who are just getting into the printing business, this can be their best starting point. Manufactured with highly durable materials, this equipment is designed to last. There is no maintenance needed once assembled. This 2 Station 4 Color Single Rotary Screen Press can simultaneously install four screen plates. The screen layer is able to rotate independently upon installation, then it is available for four colors' overprinting and making progressive proofs. 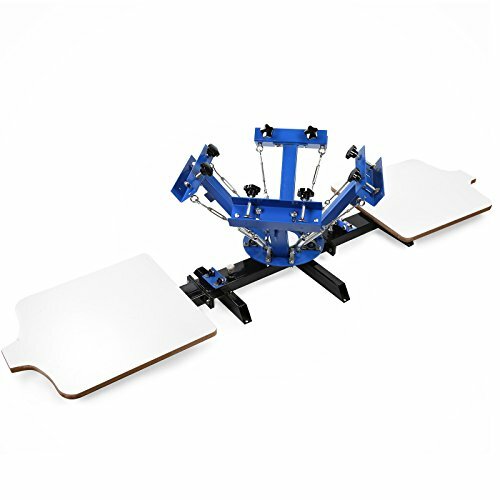 This machine is specially designed for T-shirt screen printing because of its dedicated T-shirt pallet which can guarantee the accurate positioning and good printing effect. This silk screen printing machine can print onto clothing (especially for T-shirt), woven fabric, metal, paper, copybook, plastic, circuit board, wood, glass, ceramic tile, leather and other plane printing substrates, which is especially suitable for small businesses and individual printing shop.